​Lifetime Warranty Against WHS - All of our hedgehogs sold (excluding rescues) will come with a lifetime warranty against Wobbly Hedgehog Syndrome (WHS). If your hedgehog should develop WHS, with a proof of a necropsy from a certified veterinarian of our choice, we will replace the hedgehog with the next available one at no charge. No cash refunds. ​Refund Policy - If you feel you don't provide a good enough home for your hedgehog or if you are unsatisfied with your hedgehog we will take the hedgehog back but we no longer issue refunds. No refund will be given on supplies. ​Breeding Policy - We will only sell to USDA approved Breeders. ﻿Deposit Policy - We require a $25 non-refundable deposit.. This is to ensure there are serious inquires only. The $25 deposit is not refundable, however, if you wish to change your mind, you may use that same deposit to reserve a different hedgehog. Your deposit can be paid Paypal. Waiting List - Once you have paid your $25 and we have checked over your Reservation form you will be put on our waiting list. 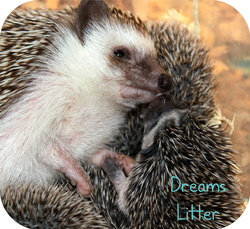 We will notify you by e-mail to let you pick out your hedgehog baby. You will then have 48 hours to get back to us before we remove you from the waiting list. Please remember to check your "Junk Mail" if you haven't heard back from us after 2 days from submitting our online Reservation form.